Noah's Ark is one of the few Bible stories that remains firmly in the public consciousness. This evening's Bible Class revisited the story from a number of different angles: chronologically, practically, dimensionally, and scientifically! 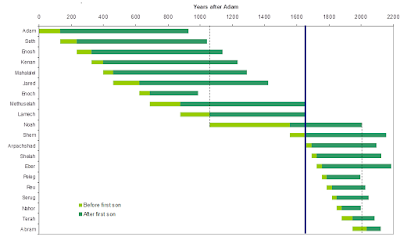 First, we explored the genealogies leading up to the flood, and then the chronology of the flood itself (see the image below, plotted from various genealogies in Genesis). A number of interesting points arise. Firstly, Noah was born early enough to be contemporary with Enosh, Adam's grandson, and lived long enough to be contemporary with Abram. Secondly, Noah and Abram share something unique among these forefathers: they both waited an extraordinary long time for their first child. Since Noah and Abram were contemporary, perhaps Noah had some wisdom to impart to Abram whilst he waited for his first child? Thirdly, there was a stark reduction in lifespan for those born after the flood. Could this be due to changes in the conditions on the earth that were less conducive to long life than the antediluvian world? Genealogy from Adam to Abram. First dotted line = the birth of Noah; Second dotted line = the death of Noah; Blue line = the Flood. Then, we explored the chronology of the flood itself. Although I've read the story a million times, I'm not sure that I would have been able to tell you that Noah and his family were inside the Ark for 7 days before the rain started (Gen7:1-4) or that they were in the Ark for more than a year in total (despite the rains falling for only 40 days!). Although we don't actually know precisely how big the Ark was because we can't be sure of the dimension of the 'cubit' that it is measured in, the Ark was pretty enormous (worth noting though that the Ark is dwarfed by the current monsters of the sea - cruise ships - there's a really clear comparison on this site, under the 'How big was the Ark section'). We were treated to a Minecraft simulation of how it would have felt to build the Ark, and what it may have been like to co-habit with a world of animals in a floating zoo! We are given the dimensions of the Ark, but not the exact plans. It is striking how artistic impressions of the Ark down the ages usually deviate wildly from even the basic dimensions of the Ark (imagine that 'bulbus' vessel with the giraffe's neck stick out - completely wrong). But Johan Huibers takes a different view: he has build a life-size model of what the Ark may very well have looked like (see below). Johan Huibers Ark (source: Wikipedia). How would you prepare if you were Noah? Noah probably had quite some time to prepare for his maiden voyage (perhaps 120 years, depending on your interpretation of Gen6:3), so he would have time to stockpile food and plan the best way to feed and water his family and animals. It would have made sense for him to include plenty of seed-containing food so that he had a seed-stock for when he disembarked. There would be no shortage of manure on board, so it's possible that Noah cultivated seedlings on board to be planted when they left the Ark. One of the common questions asked is why have the remains of the Ark never been discovered? The answer is probably simple: wood would have been in short supply in the post-flood world, so the Ark would have been used as building material for Noah and his family. As an actual real-life scientist (but by no means a geologist) the science behind Noah's Ark is a subject close to my heart. There are three common approaches to interpreting Noah's Ark in christian circles: a literal global flood, a somewhat less impressive local flood, or as a metaphor for salvation detached from actual events. Others have written interesting defenses for each of these interpretations: literal, local or metaphorical. How could Noah build the ark? How did the Egyptians build the pyramids? How did Noah collect all the animals? God overrode the animals in-build homing instinct? How did Noah fit enough species on the boat? Well, you wouldn't need every sort of every species, for example, a pair of prototype canines would cover the whole dog family. And taking juveniles would have helped with the space issue. How could the Ark survive the flood? It's likely that it wouldn't have been plain sailing - but the dimensions of the Ark do at least make sense for surviving a storm (more here). Where did all the water come from? We are told the 'waters above' and the 'fountains of the deep'. I used to be quite taken with the idea of a canopy of water vapour surrounding the earth, but it seems likely that this would make the surface of the earth intolerably hot. It seems that there was wholesale revision of whatever water cycle was in operation prior to the Flood to enable the floodwaters to rise. Where did all the water go? Perhaps simply absorbed into an altered geography and water level in the post-flood world? How did kangaroos get to Australia? It is striking that the continents resemble an enormous jigsaw. It seems likely that at some point they were connected in a Pangaea-like arrangement. If Pangaea was still intact after the flood and broke up at a later date (perhaps in the days of Peleg, when the 'earth was divided', Gen10:25), then the kangaroos would have traveled East with the Oceania continent. An alternative explanation is the existence of intercontinental land bridges in the post-flood world that have since been swallowed by the oceans. As far fetched as the land bridges idea sounds, there is evidence that they may have existed in the past. How did all races spring up from one family? This is perhaps the most difficult challenge to the chronology of the world according to the Bible (not just to the story of Noah's Ark). It seems there is just not enough time to see the degree of human and animal genetic diversity that is with us now. The easiest explanation for this one is that the inhabited earth is considerably older than Biblical timelines would have us believe. But, of course, with God all things are possible. Others have done a much better job of answering these questions (for example, this site). But it's important for all christians to at least recognise that the details of the flood as recorded in Genesis conflict pretty squarely with the current understanding of the geo-physiology of our planet. Now, that's not to say that it didn't happen in the way described - but important to recognise I think. 3. Plan ahead! It wasn't raining when Noah built the Ark. Thanks Jon for a good summary of an interesting evening. There's endless speculation, and inevitably countless web sites, debating the different ways of understanding the Bible account of the Flood. I think it's worth saying that there is nothing in the Bible record that demands a literal, whole earth interpretation and a global flood. Our English translations do make it read as if the Flood were worldwide, destroying all life on earth, but a closer look at Bible language shows that this isn't the only way to read it. For example, 'earth' is frequently used in the OT to mean 'land' or 'known world' and an alternative Hebrew word that does mean the whole earth is never used of the Flood. It's also perfectly conceivable that the descendants of Adam were still living in the one region, not yet scattered world wide, so a global flood would in that context seem unnecessary. As a historian myself (not a scientist!) the existence of Sumerian and other flood myths confirms that something significant happened in that region that left a powerful folk memory. A regional flood on the scale described in Genesis would have been just as devastating to the inhabitants then as a global flood might seem to us today. As you say, there are real problems in reconciling a worldwide flood with what we now understand from science e.g. the fossil record, the effect of the destruction of delicate ecological balances and the genealogical time frame post-flood, which doesn't seem to allow time for the development of all today's species from a limited number in the Ark - plus many more. Most of these problems disappear if we discount a literal reading of a whole earth event. In the end, perhaps, it doesn't much matter whether we interpret it locally or globally. The Bible's purpose is to teach us the moral and spiritual lesson of what happened to Noah. To my mind, the story encapsulates God's truth however we understand and interpret that truth.